Most of this book was written in 1975, after about two hundred years of Methodism in Lisburn, to celebrate the centenary of Seymour Street Methodist Church. In 1999, as we approached a new millennium and the 125th anniversary of the Church, the Leaders asked me to bring the record up to date by recording the events of the last twenty-five years. It seemed right to retain the original book in its entirety and to add a section which focused on recent events, people and property. In order to ensure uniformity of style and presentation, some minor changes have been made to the original script. mainly to do with usage and punctuation. but the text of the original remains virtually unaltered. The research for the new section required my reading more than one hundred sets of Leaders' Board minutes, and sometimes the reading of the minutes of other committees, an exercise which I do not recommend to anyone! Engaging in this exercise, however, has allowed me to reflect on a sizeable period in the life of the congregation. I have been left with several lasting impresssions. We should be grateful for the leadership we have been given: it is impossible to review the work of the last twenty-five years without recognising the commitment and devotion of many men and women who have given faithful service to the Kingdom of God in Seymour Street. The congregation have been good stewards of what has been handed on by their forebears. The work on the care and maintenance of the property demonstrates the generosity and self-sacrifice of many members who love their church and support it faithfully. It was fascinating to read, and be reminded of, the events leading up to the building of Trinity. 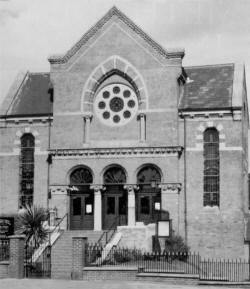 The Leaders approached the idea of Church Extension with understandable circumspection and trepidation. Much time, energy, soul-searching and prayer were devoted to the subject. It required considerable faith and courage, together with visionary leadership and risk-taking, before the critical decision was finally made. Even the most visionary of our Leaders could scarcely have envisaged that Trinity would have proved such a success story. On the negative side, I could not fail to be struck by the repeated requests for more leaders to support the youth programme of the church. Too frequently the burden of outreach fell on the shoulders of the few; not many people seemed willing to give the commitment of time and energy which is necessary for successful youth work. The Church owes a great debt of gratitude to those few who have been so faithful. 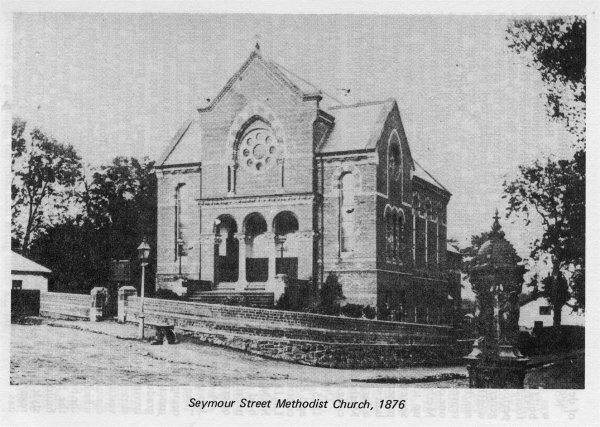 When plans were being discussed of ways in which Seymour Street Methodist Church might celebrate its Centenary in 1975, it was felt desirable that a historical account of the past hundred years should be written. It soon became obvious that something more comprehensive was called for; that to write of the past hundred years, whilst ignoring the earlier period, would provide a very incomplete record. When I agreed to undertake the writing of the record I found it much less daunting than I had feared because of the great amount of research already carried out by Mr. Charles M. Allen. This account would not have been written without Mr. Allen's thorough and painstaking researches, his desire to produce an accurate and authentic historical record, his constant help and encouragement and his willingness to discuss and investigate any problem which arose. This Introduction is the only part of the manuscript which he has not read. To him, and to Rev. John A. T. Fee, who also read the script, I owe a debt of gratitude for their many, invariably helpful, suggestions. Many others have also assisted. Several members of the Church answered our request for old documents, Annual Reports, and other material connected with the Church, much of it useful. I am particularly grateful for the help received from Mr. William Caves and Mr. Howard Stevenson. Several of the more senior members of the congregation were able to recall incidents going back to the 1920's and beyond. To all who helped I offer my thanks. 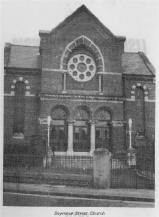 I am grateful to those who lent photographs, several of which have been used in the production, and to Mr. George Balfour, a former member of Seymour Street Church, now residing in Enniskillen, who photographed the church, the places associated with John Wesley, and several of the officials. Thanks are also due to former ministers and to others who cooperated by responding to the requests for photographs. Finally I wish to acknowledge the help and co-operation of those who lent me books, particularly Rev. J. Winston Good and Dr. Samuel Baxter; of Rev. R. Desmond Morris who so willingly agreed to write the Foreword; of Mr. John Weir, of the Wesley Historical Society, for his unfailing courtesy and patience; and of my sister-in-law, Mrs. Gordon Wileman, who generously agreed to type the manuscript. I have come to respect and admire the leaders and officials of the past hundred years. I hope, however, that those who hold office during the next hundred years will show greater interest in preserving and retaining records. of church activities, minutes of meetings and other potential historical data. I should have liked to have appended accurate lists of church officials but these are only available for the past thirty years. However, I hope that what has been written will prove of interest, that there are no errors of fact and few errors of judgment. I have no doubt that the names of many worthy members have been omitted. This, though regrettable, is almost inevitable. I apologise if there are any glaring omissions and I accept entire responsibility for any mistakes. I regard it a real privilege to be invited to write a Foreword to this excellent record of the history of Lisburn Methodist Church. My first word must be one of warmest congratulations on reaching such a significant stage in the life and witness of this virile and growing fellowship. A hundred years have passed, and I reckon that seldom has this Church been as numerically strong or as spiritually alive as at the present time. This is due, not only to the movement of the population, but also to the invaluable contributions of mind and spirit given by dedicated and devoted men and women in successive generations. We, as a family, spent eight extremely happy years on the Circuit, and we shall ever be grateful for the opportunity of identifying ourselves with such generous and warmhearted people, sharing in their joys and sorrows, and facing with them the problems, changes and challenges in Christian Mission. Throughout that period we learned much about those good and faithful servants who, long since, have joined the Church Triumphant. The memories of their loyalty, devotion and sacrifice still linger on. It is with profound gratitude that we salute our forefathers in the faith. It is most encouraging to learn of steady progress in recent years; the deepening of spiritual life; the energetic involvement in youth activities; the commitment of talented young people to the service of the Church both at Home and Overseas; and the growing concern for outreach and mission. We rejoice in every evidence of the movement of the Holy Spirit. Whilst every birthday brings with it a sense of nostalgia and a looking gratefully into the past, the real purpose of our commemoration is lost if there is not also a forward look. It would be a mistake to consider a century of achievement without turning to the future. A wise teacher has said: `The essential planning for the future is part of the duty of today.' The present is ours to use as God directs. The immediate task, in this period of change and upheaval, is of the utmost importance It may be tough, complex and exacting, but if we have the will to do it, God will supply the necessary resources.